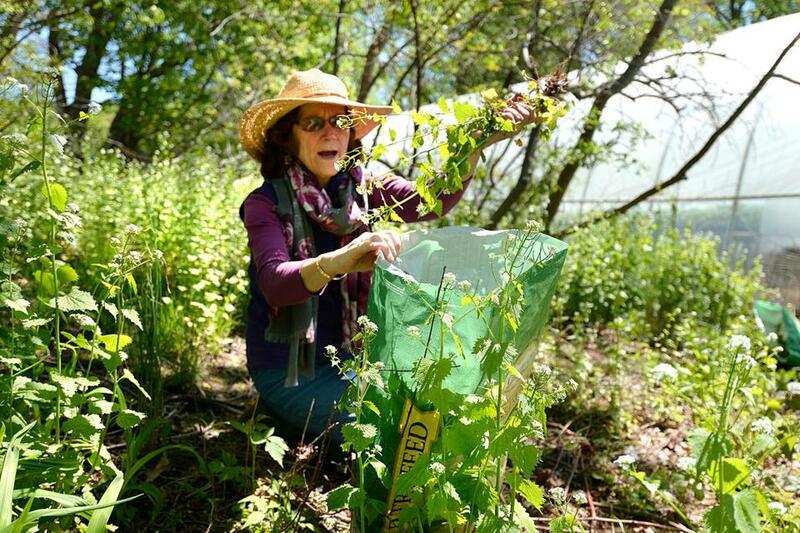 Cindy Prentice, executive director at Holly Hill Farm in Cohasset, pulling out garlic mustard plants. You can make a decent pesto from the leaves of the garlic mustard plant — but those are the only kind words you’re likely to hear about the rapidly spreading weed that is pushing out wildflowers, shrubs, and trees and threatening wildlife all over the Boston suburbs and beyond. 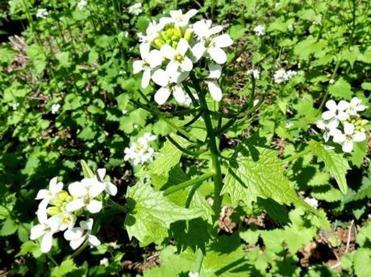 The invasive garlic mustard plant. A hardy plant native to Europe, the garlic mustard outcompetes other plants for light, nutrients, moisture, and space and can destroy entire forests, says Karen Lombard of the Nature Conservancy in Massachusetts, who is a member of the state’s Invasive Plant Advisory Group. Garlic mustard may look innocuous — even pretty with its heart-shaped garlic-scented leaves that lie in low clusters the first year, then climb up to 2- to 3-feet-high stalks topped with clusters of small white flowers and later shiny black seed pods. But the plant exudes a chemical that kills fungi needed by tree seedlings and other forest plants to survive, according to researcher Kristina Stinson at the University of Massachusetts Amherst. Adding insult to injury, local insects and wildlife don’t eat garlic mustard, and deer actually help it spread by consuming the native plants around it, she said. Plus, garlic mustard grows in sun or shade and each plant produces an average of 400 to 500 seeds that remain viable in the ground for up to five years. The garlic mustard kills all plants in its vicinity. Botanists are working on finding a biological control for the weed, but until then the best way to get rid of garlic mustard is to pull it up by the roots and destroy it. That’s exactly what volunteers did last month as part of Cohasset’s first WeedFest, an event that a group named Wild Cohasset intends to hold annually, said organizer Lisey Good. 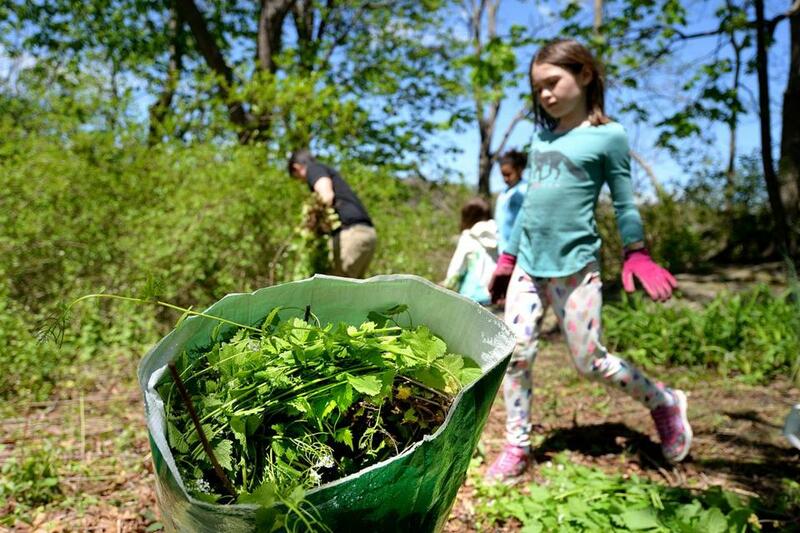 Wild Cohasset is dedicated to “bringing native plants back to our wild spaces,” targeting garlic mustard as a first step. Eight-year-old Haley Cody of Cohasset approaching a bag full of garlic mustard at Holly Hill Farm. The nearly three dozen volunteers battled poison ivy and ticks in three locations in Cohasset — Holly Hill Farm, Black Rock Road, and the slope next to St. Stephen’s Episcopal Church across from Cohasset Common — to fill 60 mega-sized trash bags with approximately 12,000 plants, Good said. She said people were particularly concerned that garlic mustard is hurting wildlife, such as the monarch butterfly and hummingbirds, by killing the plants on which they rely. 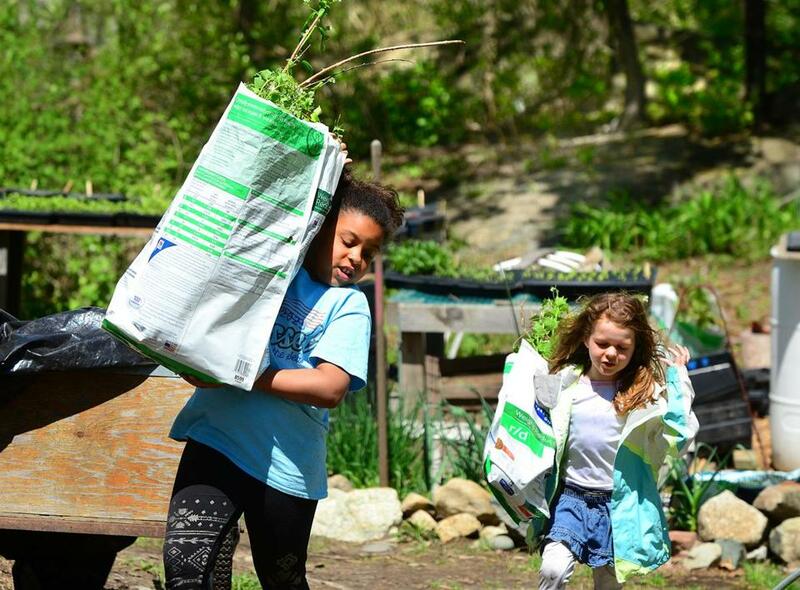 Eight-year-old Ava Coffey, left, and Bree Cody, 5, both of Cohasset, carrying bags of garlic mustard at Holly Hill Farm. Similar mass pullings are happening around Greater Boston in places such as Acton, Concord, Lincoln, and Newton. And for the past four years, New Hampshire has run a Garlic Mustard Challenge that encourages teams to strip the weed from private and public land; in 2016, volunteers reported gathering 6,750 pounds of the pesky plant. Acton has been going after garlic mustard on conservation land for the last 10 years and is making some progress, said Jim Snyder-Grant of the Acton Land Stewardship Committee. Parts of the Acton Arboretum, for example, are free of garlic mustard after five years of intensive picking, he said. And other places where it once took days to rip out the plants can now be picked clean in an hour with a single volunteer, he said. But he said that his group is still finding new places infested by the weed, and it is starting to focus on educating the owners of private property adjacent to the public conservation land. Snyder-Grant said his group goes after garlic mustard because it reduces biodiversity — which conservation land is designed to protect — and because it’s a butterfly and moth killer. Another reason is related to the history of invasive plants like garlic mustard, which was introduced to the United States from Europe in the 1800s as a medicinal and food crop and later spread out of control. “I feel like we humans put these plants here, so it’s our job to clean them up. It’s like picking up a piece of trash,” Snyder-Grant said. The town of Lincoln also is actively fighting garlic mustard, according to Amber Carr, who coordinates invasive plant management in the Sudbury, Assabet, and Concord River watershed area that covers 36 towns and 377 square miles. “Lincoln puts up signs around town encouraging private landowners to bag [garlic mustard] and coordinates with the DPW to bring it to an invasive plant waste disposal area,” Carr said. “They let it decompose, but don’t include it with the rest of the town compost,” so it won’t spread. “It’s a great plant to focus on, because it responds well to hand-pulling and you don’t have to resort to pesticides,” she said. And for those willing to experiment, there is the pesto: Snyder-Grant shares his recipe at www.actoninvasives.blogspot.com/2013/05/garlic-mustard-pesto-recipe.html. He noted that garlic mustard often grows near poison ivy, so chefs should be careful not to include the latter.